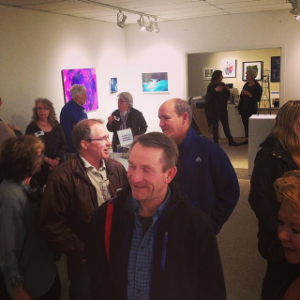 As an emerging artist, curator and stylist, gallery events are a major part of my personal and professional life. But even as an insider, it can be intimidating walking into a gallery. I know that. I also know that there are plenty of people interested in local art who might not know how or where to best access it. With that in mind, I've put together tips for getting started, along with a cheat sheet of some great galleries in Rhode Island that I think are extremely art novice friendly. 1. Go to galleries during events or openings. This takes the pressure off just walking in alone. This also gives you the opportunity to listen to other people's conversations about the art and pick up some of the vernacular. In addition, the artists, curators and gallerists are often present, so you can ask them questions as part of the crowd. Joining gallery mailing lists and/or subscribing to their events on Facebook helps keep you in the know. 2. Bring a date or some friends. Bringing a buddy to galleries can help facilitate conversation. Your date or friends might even point out conceptual details you may have missed. Also, art events often have free snacks and drinks, so it's a fun date or group activity that fits into anyone’s budget whether they're in the market to buy (art) or not. 3. Read about the show online before you go. It isn't cheating. Just look at it as doing your homework beforehand, so you're more prepared for what you're about to see, much like watching a trailer before going to the movies. 4. Remember there are no wrong answers! The best thing about art is you're allowed to think and feel whatever you want about it. Even if you hate a show or don’t understand how the work is indicative of what the artist is going for, don’t worry - that’s part of the greater conversation and as an art person I love that aspect. Click here for the AS220 Facebook Page. Click here for the Hera Gallery FB Page. Click here for the Yellow Peril Gallery FB Page. Click here to see the Grin Gallery PVD Facebook Page. Click here for the Van Vessem Gallery FB Page. Click here to check out the Seen Gallery FB Page. Next Opening/Event: Check their website. Have fun gallery hopping this summer...Say hi if you see me around! Brooke Erin Goldstein is a Creative Professional living and working in Providence RI. She has a BFA from the RISD, majoring in textiles. Brooke worked in the fashion industry for 5 years before starting her own businesses. Since then she has been working for herself providing personal and creative services for over 10 years. To see more (guest) blogs by Brooke, click here and here. Photo Credits: All photo’s taken from the galleries’ websites or social media.